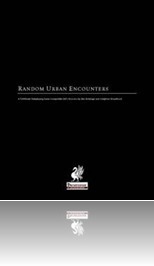 This installment of Raging Swan Press‘ “Urban Encounters”-line is 22 pages long, 1 page front cover, 1 page advertisement, 2 pages editorial, 1 page ToC/foreword/stat-blocks by CR/encounters by EL, 1 page advice on how to read statblocks for novice GMs, 1 page SRD and 1 page back cover, leaving a total of 14 pages for the new encounters, so let’s take a look! Since this review takes a look at ready-made encounters to be inserted in an urban environment, the following review contains SPOILERS. Potential players may wish to jump to the conclusion. Still here? OK! The first of the encounters has the PCs witnessing one of the two basic clichés of “You walk by a dark alley…” – the roughing up of some guy by armed men. Unbeknownst to the PCs, though, the man is a fence and the mercenaries have been hired by legit businessmen to teach the dealer in illicit goods a lesson. The PCs can support either party and get appropriate benefits. While I like that there’s no clear-cut good-evil-distinction here, I was rather underwhelmed by this particular encounter. Thankfully, the next one more than makes up for it: Tengu thieves try to steal from the PCs and bolt – the chase is on! A flow-chart provides an easy way to handle the chase and each section provides two options to move on. The mechanics are fun, simple and cool. The third encounter has the PCs contacted by a destitute noble to take care about some ghouls that haunt the local graveyard – two acrobatic brothers. An ok encounter, I guess, though some environmental effects/descriptions of the ghoul’s antics, sample DCs for jumping from tombstone to tombstone/mausoleum etc. would have been nice. Law & Order: The taxman and Law & Order: The Watch provide statblocks for guardsmen, a sergeant and the taxman as well as 2 NPC write-ups, but no complications/environmental hazards – essentially they only are short collections of low-level statblocks, not true encounters. After that one, a daughter of a jeweler who’s new in town contacts the PCs – her father is being hurt! The thug works for the local upstart thieves guild and wants to expand into the protection racket business. With or without the help of the local guardsman, the PCs can break into the back of the shop and rescue the jeweler. Information for all 3 NPCs are provided, as well as stats and even some read-aloud text for eavesdropping PCs. Again, an ok encounter, but some kind of unique feature of the shop (Glass cabinets? Perhaps gem-cutting implements?) would have made it more memorable. The next encounter is rather useful for any GM in that it provides three sample statblocks for thieves and cutpurses as well as 5 suggested encounters (EL 1-5) and 10 different distractions. It is especially latter list that makes me enjoy this entry – I would have liked to see more potential complications the thieves might use to shake off pursuers, though. When Milt, a filthy never-do-well of the streets confides his crimes in the PCs they may feel rather pity than the urge to hand over the destitute commoner to the watch – especially once he tells them about his partner in crime, who may be infected by lycanthropy and thus be responsible for the recent string of death. he wants them to find his partner and put a stop to his violent spree. An ok encounter, again, though as the fight takes place in a hovel in the slums, I would have enjoyed more environmental peculiarities. Editing and formatting, as I’ve come to expect from Raging Swan press, are top-notch: I didn’t notice any glitches. Layout adheres to RSP’s easy-to-read 2-column b/w-standard and the artworks are neat. The pdf comes in two versions, one optimized for screen-use and one to be printed out and also provides all the statblocks in one collated file so you can easily add it to your statblock library. The pdfs come with full nested bookmarks. Oh boy. On the one hand, I consider the section on cutpurses interesting and the chase-encounter cool. The NPCs are nice and having their mannerisms etc. is cool. But quite frankly, that’s it. I am rather sad to say, but this installment of the “Random Encounters…”-line just felt (with the exception of said chase) terribly bland to me. If you’re in for the statblocks, ok, but quite frankly, these encounters are not fleshed out enough to not be something any GM worth his salt could improvise. There’s no twist, no complex statblock, no unique environmental hazard. The distraction-table for the thieves is one glimmer among encounters I perceived as rather dull. Why not provide unique urban complications, like e.g. in the Kobold Ghetto of OD’s Zobeck Gazetteer? There’s also a distinct focus on the run-of-the-mill basic urban clichés – boring thugs and mercenaries, ghouls and a lycanthropy-afflicted person. Where are the leprous beggars? Where’s the cat-burglar who missed jumping rooftops and now needs the PCs to hide him from the watch? Where’s the slumming aristocrat who draws the PCs into his revelries? Instead of more diverse ones, we essentially get repetitions of the watch vs. rogues tropes and two other clichés that have been done to death. Especially when compared to “Random Marsh Encounters”, this one falls very painfully flat in that it does not take its setting and the options available into account. And yeah, the other installments also had “classic” encounters, but they felt more…unique. Organic. E.g. a certain jeweler’s shop feels very sterile. You can jump on the counter and there are boxes in the back room. Really? No loot for the PCs to plunder subtly? No glass cases to crash? No caltrop-like shards on the floor? See what I’m doing? I can come up with more intriguing additions to these encounters – easily. As written, they unfortunately display a severe case of feeling like bland cardboard cut-outs lacking unique details and, at least for me, fail horribly at what they set out to do. This lack of imaginative components becomes especially readily apparent when e.g. compared to Raging Swan’s own “Caves and Caverns”, which I’d much rather advise you to buy. And two of the “encounters” are not encounters, but just NPC-write-ups with some stats for generic low-level watchmen accompanying them. Let’s sum it up: I enjoyed one encounter. One encounter is an ok GM-aid for low-level pickpockets. The rest? Unfortunately utterly forgettable and 2 of the encounters only provide statblocks for low-level officials (sergeant, taxman) and watchmen without being an encounter. If you’re in need of some low-level statblocks or a true novice among GMs who hasn’t yet used the trite clichés on his players, this might work for you and could be considered a 3 star-file. For everyone else, though, I fear I can’t recommend this pdf. Since the chase scene is nice and the production values are good, I’ll settle for a final verdict of 2.5 stars, rounded down to 2 for the purpose of this platform. Get the other installments of the line, they are vastly superior.